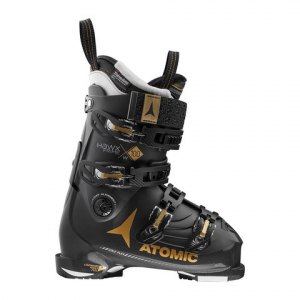 If you're a ripper skier gal, look no further than the Hawx Prime 100 Boots from Atomic. The Hawx Prime 100 is a high performance women's boot that for the past few years has had one of the greatest fits for women anywhere. It has an average 100mm last forefoot with a narrow heel pocket that really holds your foot in place and its memory fit liner heats up while your foot breaks in the boot. With a 100 flex and a very comfy upper cuff that's been designed specifically for a women's build, the Hawx Prime 100 is an all mountain boot that can't be denied. This ultra comfy boot lets you ski anywhere, in the trees and the bowls, to a fast groomer day and when it comes to fit and performance, you can't go wrong.